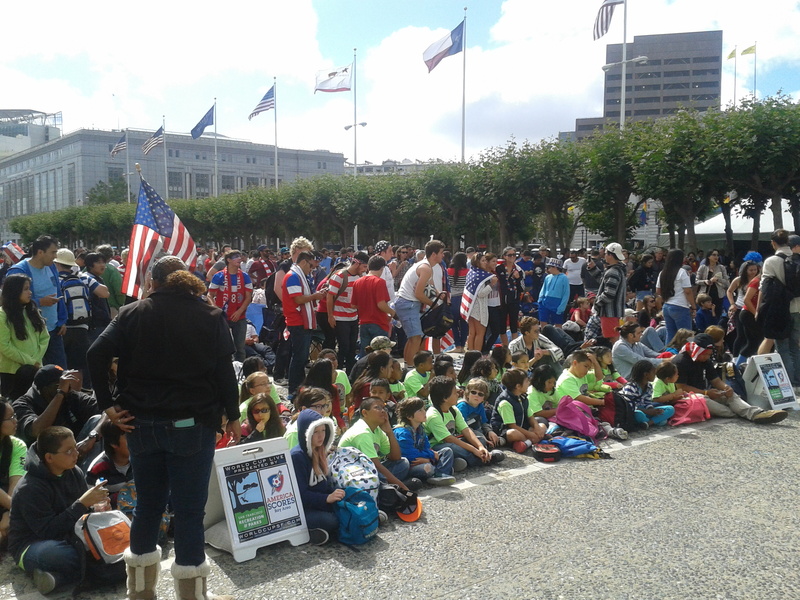 Crowds of fans clad in red, white and blue gear packed San Francisco’s Civic Center Plaza this afternoon to watch the U.S. face Belgium in the round of 16 of the World Cup. 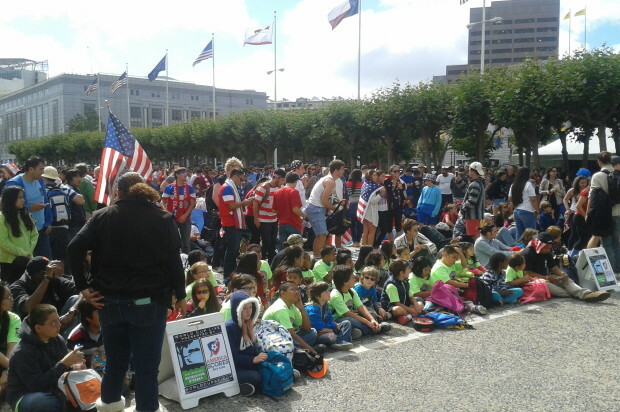 The city’s Recreation and Park Department hosted the free public screening in partnership with American SCORES Bay Area and sponsorship from Twitter and Visa. Die-hard fans cheered alongside office workers catching a few minutes of the 1 p.m. match during their lunch break. Food trucks conveniently lined the back of the plaza to provide nourishment for hungry fans. With the U.S. and Belgium tied 0-0 at halftime, Pendergast was circumspect about the U.S. team’s chances. “I’m always optimistic, but I like to think I’m reality-based as well,” Pendergast. Elizabeth Ramos, 24, watched the match draped in an American flag even though she had been rooting for Mexico before they were knocked out of the tournament. Ramos, who is a fan of the Mexican soccer team Chivas, recently quit her job. “This is my fun-employment activity,” Ramos said. U.S. fan Austin Roach, 20, sported full American flag face paint. He traveled from Antioch with a large group of spirited friends to watch the match in San Francisco. “We decided to make a day out of it,” said Roach, who took the day off of work. Alas, belief was not enough. The U.S. lost to Belgium 2-1 in extra time and were eliminated from the tournament. The Recreation and Park Department will screen the World Cup semifinals on July 9 and the final on July 13.